Different organizations have different organizational structures. Matrix organization is one of the most popular and widely used type of organization structure. Use ConceptDraw DIAGRAM diagramming and vector drawing software extended with 25 Typical Orgcharts solution from the Management area of ConceptDraw Solution Park for fast and easy designing matrix organization chart for your company. 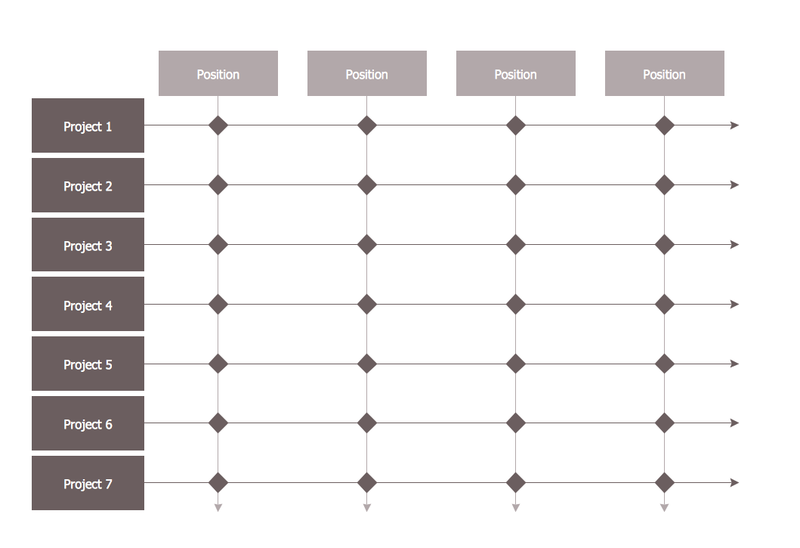 25 Typical Orgcharts Solution offers 5 different Matrix Organization Chart templates. You can find them in ConceptDraw STORE. Each of them is a real help for self-dependent drawing! Now you don't need to be an artist and you can completely concentrate on your organization and on the filling of ready template, all rest is already made instead of you. Any of these templates can be easy modified using the predesigned objects from the Organizational Chart and Organizational Chart (people) libraries of 25 Typical Orgcharts Solution. 25 predesigned templates and 10 samples give you the good start for your own diagrams. 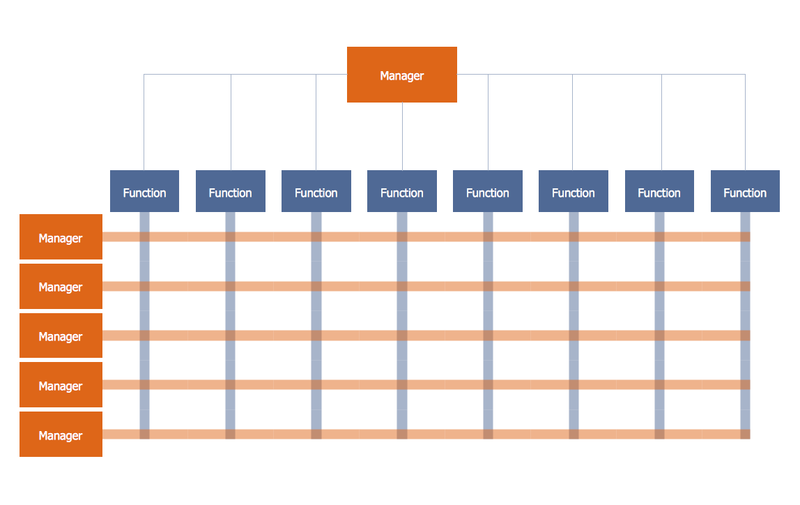 An orgchart shows how the responsibilities are divided between departments. 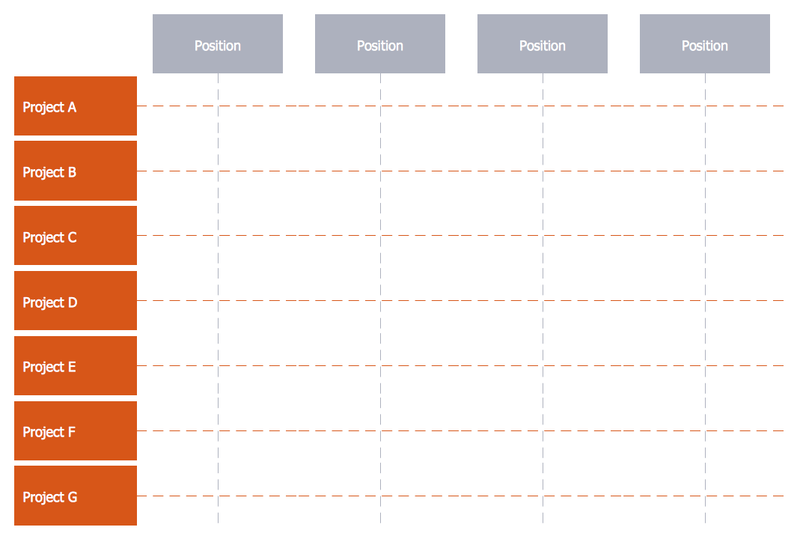 It’s enough to have just one look on a proper organizational chart template to understand the idea and how it works. To understand how it’s made you should use a diagramming software. 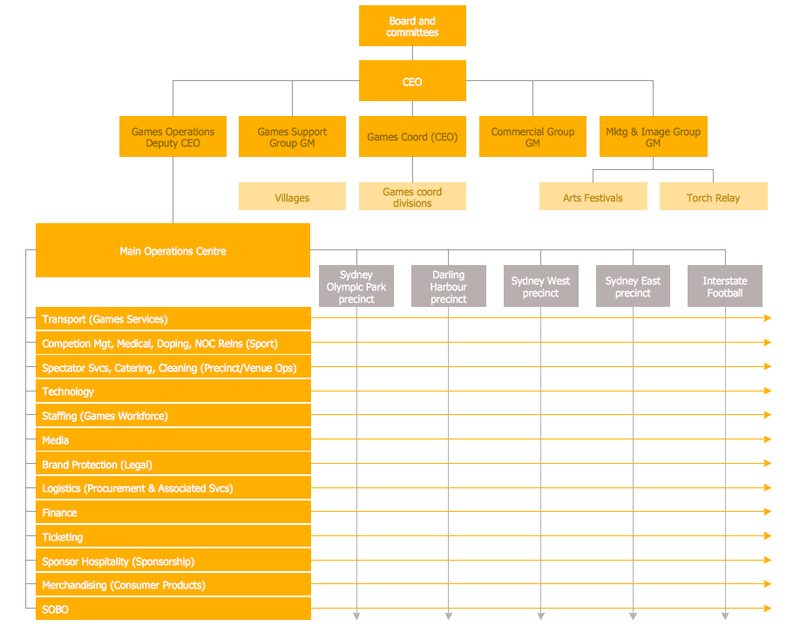 This organizational diagram illustrates the possibilities of using ConceptDraw DIAGRAM v12 to create orgcharts. This sample represents the common project management company. The chart shows the structure of devisions in the company, and the interaction between them. Communication between departments imply a certain structure affiliation and reporting. At the head of the company - President. 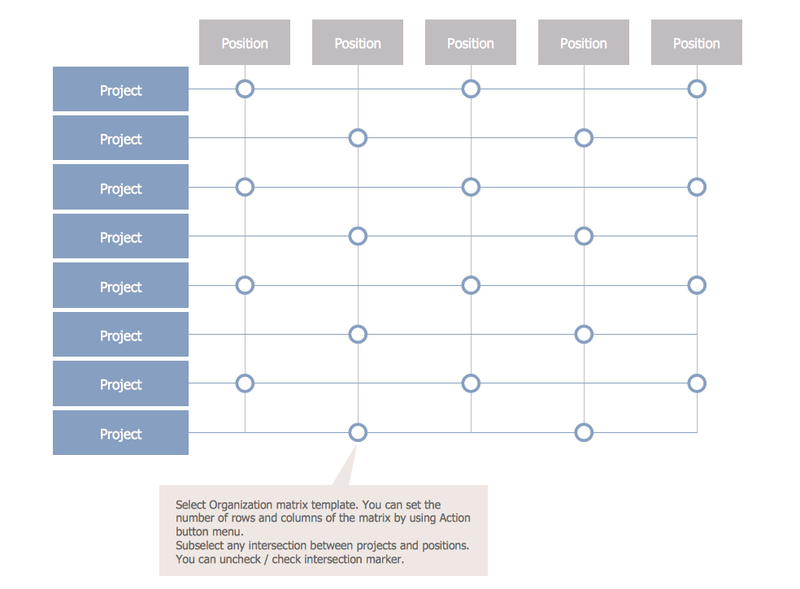 This diagram was created using ConceptDraw solution for designing Organizational charts of any structure and complexity. The onion diagram is a type of diagram which shows the dependencies among parts of an organization or process. The items are displayed at the concentric circles, where the items at the bigger rings depend on the items at the smaller rings. ConceptDraw DIAGRAM v12 diagramming and vector drawing software extended with Stakeholder Onion Diagrams Solution from the Management Area of ConceptDraw Solution Park is a professional Onion Diagram Maker. ConceptDraw DIAGRAM v12 software extended with Matrices Solution from the Marketing Area of ConceptDraw Solution Park offers you the possibility to develop the Ansoff Matrix of any complexity. If your company is in chaos in clutter and no one understands their rights and responsibilities, maybe it's time to change that. One of the ways to put the company in order is to draw an organization chart that would reflect the structure and show the relationships among departments and positions. This is a very useful and easy to understand scheme. This is example of the one of the most typical kind of organizational chart. It depicts an organizational structure of the hierarchical type. Its construction is similarv to pyramid. The single main position on the top - in this case, the mayor's position followed by sub-levels of authority in his command. Each position in the pyramid reports only to his supervisor, and takes only a report of direct subordinates. Such scheme limits the number of communications. This organizational structure is effectively used in public organizations. Also it is suitable for any organization with the need for multiple levels of middle managers. 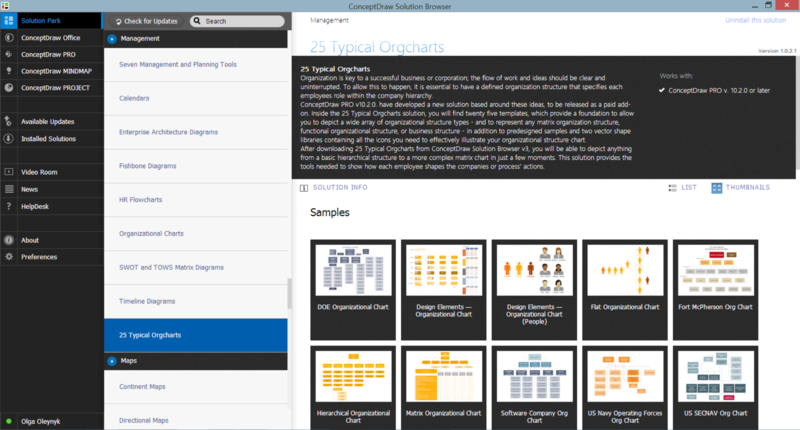 The ability to create organizational charts of different types is supplied with ConceptDraw Ogrcharts solutions.